"RAISING BERTIE is the kind of movie that understands the intrinsic link between the political and the personal." "Margaret Byrne's RAISING BERTIE is a testament to patience, empathy, and a willingness to allow the subjects and the material to define the form of a documentary, not the other way around." "Byrne is the furthest thing from a manipulative filmmaker. But RAISING BERTIE is moving nonetheless." "Raising Bertie paints a coming-of-age portrait that is constantly aware of the external influences that culminate to shape the identity of its three subjects—Dada, Junior, and Bud—but presents them with such personable observation that the young men’s complexity outshines all culturally and narratively shaped expectation." "One of the best movies you'll see this year...Insightful, raw, and visually beautiful." "Impressive directorial debut... alternates between triumph and tragedy, but there's never a moment that doesn't feel intimate and authentic." "Powerfully drives home what is obvious and yet what most of us fail to see: Bertie County is America. It's Chicago. It's Detroit. It's Los Angeles. It's a portrait of communities and families striving to do right by their kids, but where schools and lack of job programs fail to meet communities' most desperate needs." "A moving chronicle, and a potent treatise on institutional failings that knows to demonstrate said problems instead of merely preaching them. " "The experiences and challenges of the rural poor might make it into the national conversation as an abstraction, but rarely with the specificity of this intimate portrait of a black community."[... ]"puts faces on a labor force that helps feed many Americans and generally goes unseen and unheard." "Essential... Charts nothing less than what it’s like to try to grow up free in the prison capital of the world." "Politically timely and artistically consummate...this focused and nuanced look at a resilient but deeply strained African American township carries urgent implications for all of us." 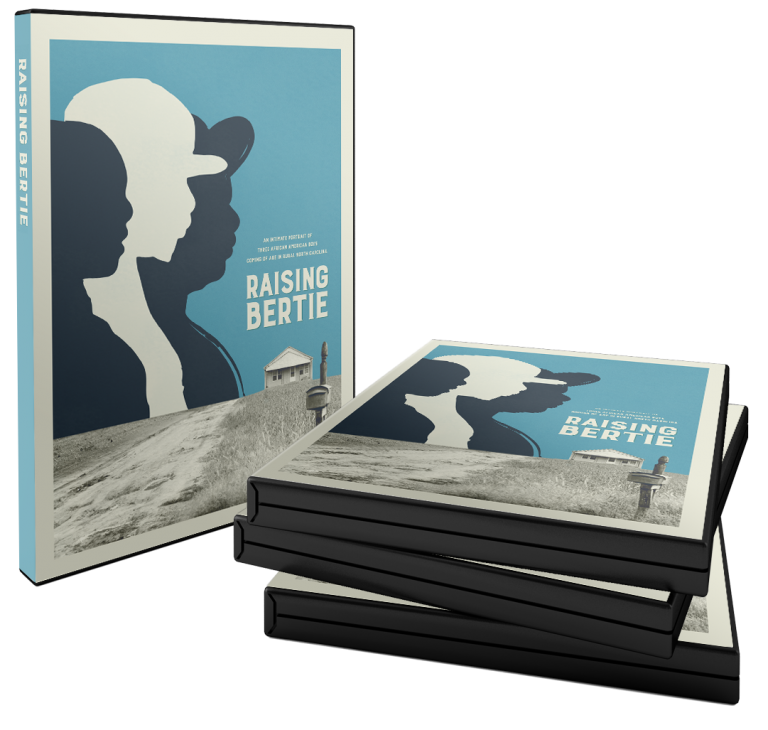 "Now more than ever, the world needs Raising Bertie, especially the white world...Raising Bertie puts viewers in the shoes of these boys, offering an understanding and appreciation of their lives – and, in turn offers a viewing experience that is wholly relatable for everyone, regardless of race, gender, age or economic background." "It’s impossible to watch Raising Bertie, a deeply felt documentary about three young black men coming of age in rural North Carolina, and not be reminded how the misguided post-election directive to empathize with certain residents of low-opportunity rural America callously fails to extend to people of color...[Raising Bertie] shows us lives that are rich, nuanced and—despite obstacles and errors in judgment—deep with resilience." "The conversation of the United States is often defined by what people think and feel on the coasts, and we were certainly reminded recently that there can be very different worldviews and experiences in the heartland that are rarely shown for public consumption. And yet it never feels like Byrne’s film is designed as a statement about all black young men living on the edge of poverty and falling through the cracks of our educational system. It is a case study, a film driven by the people it captures." "Byrne masterfully uses her access to create empathy for the teenagers' plight...Raising Bertie strongly executes the things that a documentary in this genre should accomplish–it points to a larger issue by using the affected individuals to tell an honest story." "Over the years, Kartemquin Films has produced some of the most powerful and fascinating documentaries of our time–Hoop Dreams, Stevie, Life Itself and The Interrupters among them and their latest release, Raising Bertie, deserves a place among them." "A work that digs deep and examines the factors that go into creating and destroying dreams among rural youth." Byrne masterfully uses her access to create empathy for the teenagers' plight...Raising Bertie strongly executes the things that a documentary in this genre should accomplish—it points to a larger issue by using the affected individuals to tell an honest story. "Here is a documentary that follows the daily lives of three African-American young men at a time in our nation when it is imperative that racial stereotypes be removed from their representation. Set in Bertie County in Eastern North Carolina, the film takes an intimate and insightful six-year look into the lives of Reginald “Junior” Askew, David “Bud” Perry, and Davonte “Dada” Harrell as they experience the uncertain and pivotal teenage years, while trying to determine their own identities and future." "This lovingly produced yet unflinchingly shot film- compliments to director of photography Jon Stuyvesant- follows 3 young black men over a 6-year period, as they deal with the relationships between themselves, their community, their families, and their scant educational and employment opportunities." "Byrne offers an unusually intimate view of these young men’s lives, telling stories that are often left out in discussions of racism and poverty." "Riveting... there are no true happy endings, but after spending two hours with these remarkable people and gaining an understanding of their plight, it renews your faith in the human spirit." "Raising Bertie is the Boyhood of this year's AFI DOCS, but with more of an urgent social subtext... However, Byrne’s film stays away from being overly didactic. The movie may hint at bigger narratives regarding race and America’s wealth gap, but it also never stoops to suggesting that the documentary is anything more than a specific snapshot of three people’s lives. Its smallness is its greatest virtue." "Brilliantly weaves the young men’s stories together, as they transition from their teens into manhood, engaged in a shared struggle for social and economic survival." — Rob Tiller, The Casual Blog.